The Quadstick now can connect directly to a PS4. This article is out of date but the Quadstick can still be connected to the PS4 the way it describes, which may be useful for some users. There are three distinct methods of connecting the CronusMax to the PS4. Each has pros and cons. DS4 must remain plugged in to USB hub and cannot be used as second controller. Simpler connection. Just insert the CronusMax between the PS4 and the QuadStick. No authentication procedure needed. You do not need a Dual Shock 4 controller to authenticate, like you do with the XBox consoles. You can use the Dual Shock 4 that came with the PS4 as a second controller for two player games. Approximately every ten minutes, a "controller disconnected" message may appear on screen when the CronusMax resets the connection. Some games can be disrupted by this and you will lose control for about one second. The QuadStick is connected to the PC during game play and can be used to control the PC if using Dragon Naturally Speaking and voice commands or for other purposes, like mixing in UltraStiks, keyboards, or other input devices. Since QuadStick Manager Program version 1.03, voice commands can be sent to the QuadStick over the USB connection instead of Bluetooth or a Serial cable connection. More complicated connection requiring a PC in the middle. The QuadStick Manager Program must be running. Dual Shock 4 controller must remain plugged into the Input of the CronusMax and cannot be used as a second player's controller. Once you have CronusPro installed, then in CronusPro->Tools->Options->CMax Plus->Enable PS4 partial crossover support unless you plan to use Full Crossover support with a USB hub. When using the CronusMax the next time, click the push button on the front of it until it displays a 1. The gamepack must be running for the Touchpad mode to work. With the latest version of the Default Configuration on your QuadStick, a Mouthpiece Right Puff Soft will put the QuadStick in Right Analog mode (3) and move the Touchpad cursor around joystick. You can "press" the touchpad while in this mode with R1 (normally it mapped to Select). Do mp_right_puff_soft again to turn off the Touchpad mode. Since the QuadStick is a PS3 compatible controller, we use ControlerMax's CronusMax device to adapt its signals for other consoles. Support for the PS4's touchpad is limited to the Press function, not the Swipe. Both the PS4 and XBox consoles require the CronusMax to authenticate itself with the console using an official controller. For the XBox consoles, this occurs once at startup, so when the authentication has completed, the XBox controller can be unplugged and the QuadStick plugged in to the CronusMax's input. With the PS4 this authentication is continuous, which forces a different strategy. On the side of the CronusMax is a USB-mini connector labeled PCPROG. This port can be used to inject commands from a PC into the data stream going to the console, while allowing the authentication messages to be handled by a wired PS4 controller plugged into the Input port. 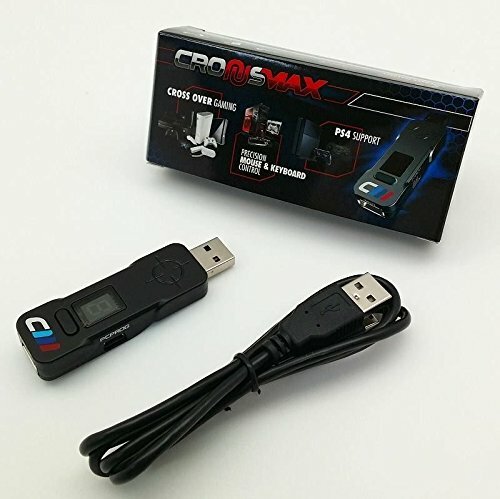 The PC can use either the QuadStick Manager Program (QMP) or ControllerMax's GTuner MaxAimDI plug-in to transfer signals from the QuadStick to the CronusMax. MaxAimDI allows the user to bring in additional inputs from the PC's mouse or keyboard to supplement the QuadStick and map them to the console as they please, whereas the QMP passes signals directly from the QuadStick to the CronusMax. The CronusMax support for the PS4 TouchPad is limited to Pressing the TouchPad, not swiping gestures. You can read the manufacturer's statement here. In addition to the PS4, this same setup will for any of the other consoles supported by the CronusMax: XBox One, XBox 360 & PS3. This allows the QuadStick to remain connected to the PC, and useable as a mouse/keyboard, while controlling a game console as a joystick.